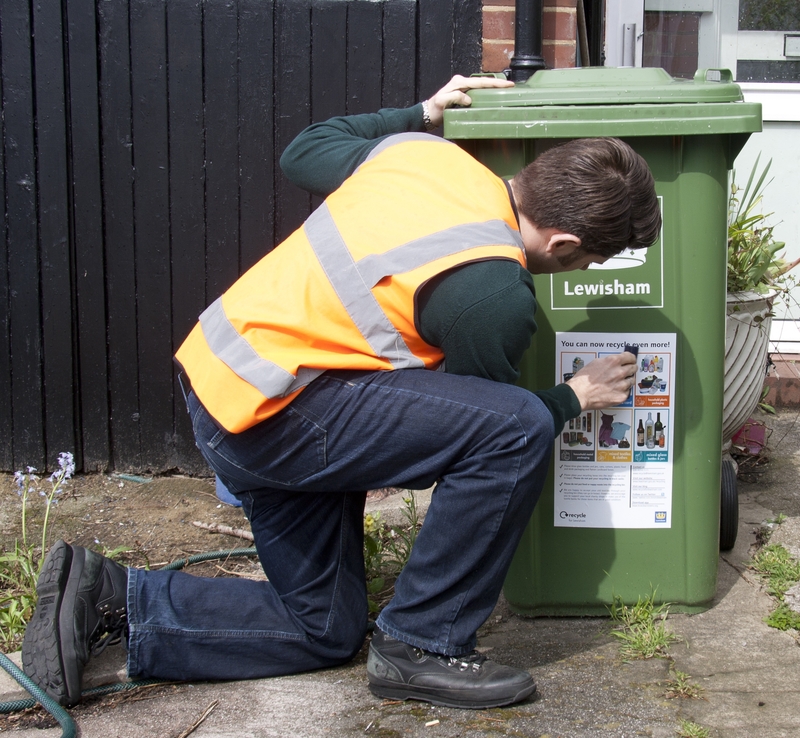 Work has begun on putting new stickers on all of Lewisham’s recycling bins so that residents will have a clear and easy guide as to what can now be recycled in the borough. From December 2011, the Council started a new contract with the contractor Bywaters in Bow,East London. Under this new contract the Council are able to recycle more materials, which means that you can now recycle, paper, cardboard, glass, cans, plastic bottles, textiles, mixed plastics, shredded paper and beverage cartons (tetra paks). Please make sure all of the above are clean before putting them into your recycling bin. The teams that are putting the stickers onto the bins are currently in the Lee area and will be gradually making their way around the rest of the borough to ensure that all residents 240 litre recycling bins receive a sticker. The sticker clearly illustrates exactly what can go into the recycling bins using photographs to ensure we get the message to everyone about the new materials. With the Council now receiving an income for everything that is recycled, it is more important than ever for all the residents of the borough to recycle as much of their waste as they can. With regard to the recycling of textiles, if they are in good condition, we would recommend that they go to a charity shop in the first instance. However, if you feel that they might not be worth giving to a charity shop, then please use your recycling bin. 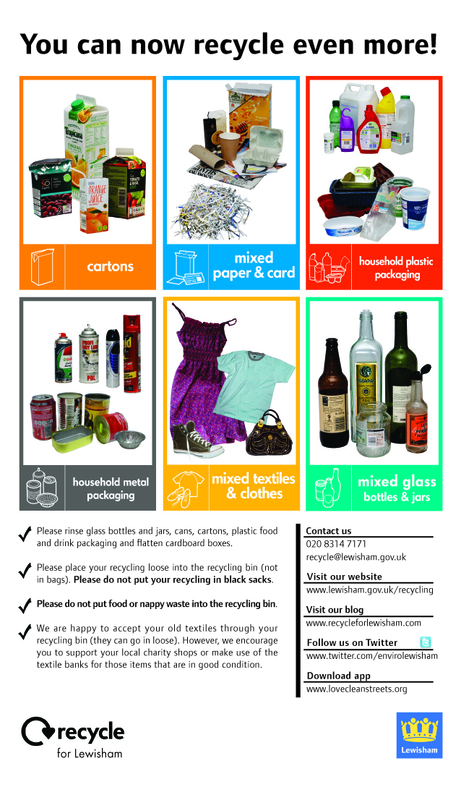 Categories: Cardboard, Environmental Campaigns, Mixed Plastics, MRF, Paper, plastic bottles, recycling, Tetra-paks, Textiles, Uncategorized | Tags: bins get new stickers, new recycling materials in Lewisham, new recycling stickers for Lewisham, New Waste Contract, recycling bins in Lewisham, Recycling in Lewisham, recycling stickers, residents can recycle more in Lewisham | Permalink.